Ever thought about writing a Mac GUI in C#? You’re probably used to Buttons, Panels, Dialogs and the like, but how do they map to the Mac counterparts? Well, this is what we try to cover in this post: a Cocoa 101 for WinForms developers. We wanted to develop a Mac native UI for SemanticMerge and then we faced some decisions: stay in C#? Move to Objective-C? Get used to the Interface Builder or ignore it? 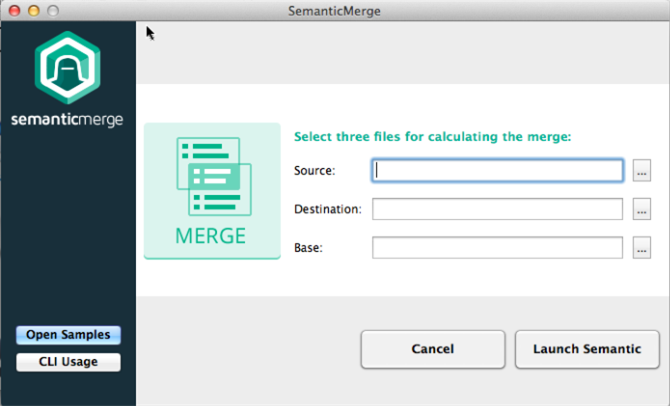 Since other teams might be facing a similar situation we thought it would be good to dissect our SemanticMerge GUI and use it to explain some Mac GUI development essentials. Before entering the Cocoa 101 we had to decide whether we should go for Objective-C or not and whether we should go for a native UI or try something like Qt. In a previous post we also covered some MonoMac basics and then one interesting topic: should you use the Interface Builder or go hard-core and code the entire GUI? You start and write your first “hello world” in Xamarin Studio but then you’ve to figure out how to really structure your app. And then is when worlds collide. As Windows developers we were used to Buttons, Forms, Panels, Splitters and all but… that’s not the same thing when you get to Xamarin.Mac. You’ve to get used to the Cocoa and a new set of controls. 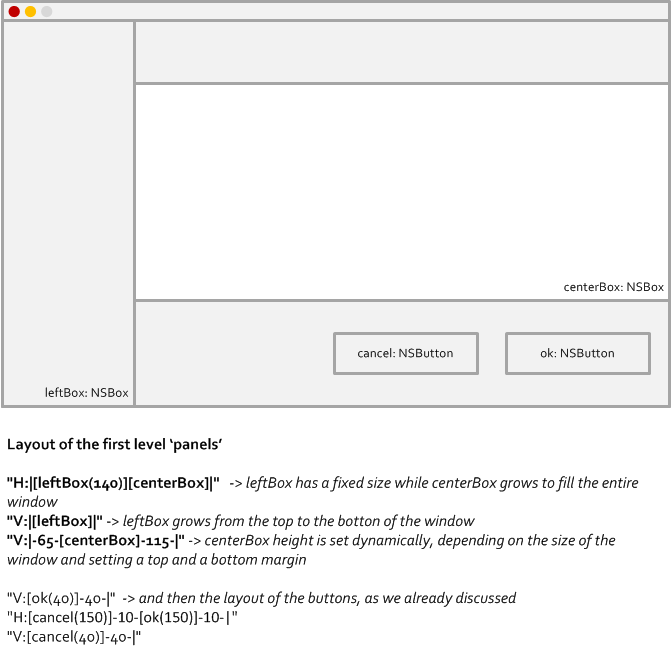 The picture shows all the controls we use in this simple dialog and I think it is a good way to get familiar with Cocoa if you come from a Windows background. The Window has a ContentView which is the one you’ll use to place more controls inside. 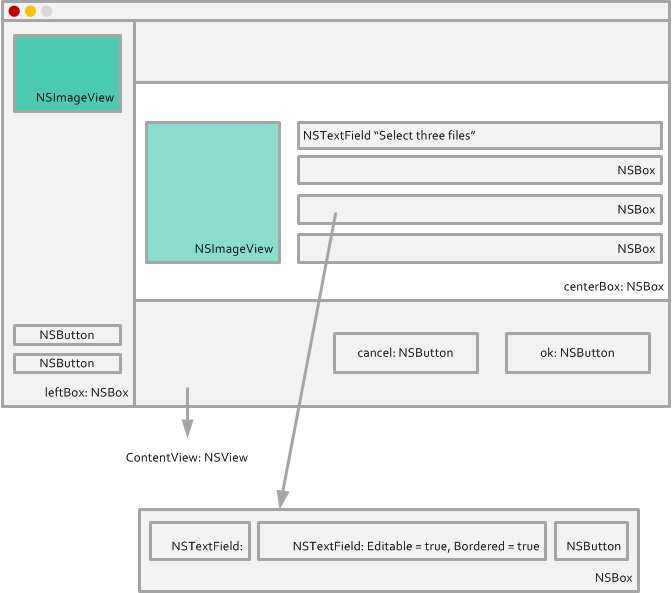 The ContentView is an NSView. The NSBoxes are somehow similar to Panels in WinForms. You can use them to contain other controls. Buttons: all buttons in Cocoa will be of type NSButton, but then you’ll set properties to it depending on the style of the button you want to use. Something similar happens with NSTextField: you can use a TextField as a WinForms TextBox, but you can also configure it to be like a Label. In the picture I defined the ‘edit boxes’ as NSTextFields with “Editable = true” and “Bordered = true”. Once you meet a few controls is time to know how to align them. You can always just place them in the Window ContentView with global coordinates, but it won’t help if you need your NSBoxes to grow with the window, or your buttons to keep aligned to the right. While we were all familiar with Anchors in WinForms, to code UIs in Mac we need to learn the Constraints. Constraints are the set of rules you use to define where each control is located, aligned and so on. The ‘language’ to define constrains can be intimidating at first, but it is really easy to learn and very powerful. I’ll first explain how constraints are defined and later I’ll cover how to code it in C#. 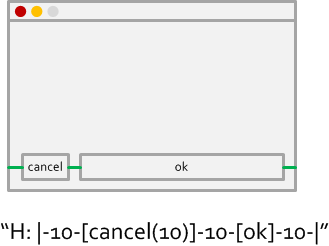 If we don’t set the constraints correctly (step 2) then when the window grows the buttons will stay on the same position, losing the correct relative position “anchored” to the bottom right of the window. In step 3 the constraints are correctly set and the buttons keep the relative position to the bottom right. How do we achieve this? With the ‘magic of Mac constraint rules’. H: stands for horizontal rule. 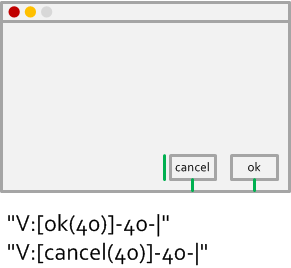 [cancel(150)] refers to the “cancel” button (later I’ll explain how do you tell the system that the button will be named ‘cancel’ when specifying contraints. -10- means you’re separating the two buttons with a “10 size” separation. [ok(150)] gives a 150 size to the “ok” button. 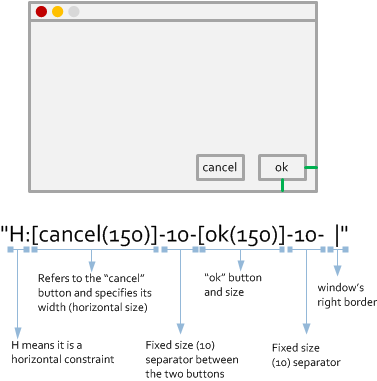 | the last vertical bar on a horizontal constraint rule refers to the right border of the window. It is the piece of the constraint saying “keep everything aligned to the right”. The language is easy to remember and very powerful as you can see. Since we’re only specifying the “right border” it means everything will be relative to the right. Notice I didn’t set a “left bar” which means the buttons will be ‘anchored’ to the right. The “cancel” button should be linked to the left border with a 10 points margin. Then there will be another “10” separator between the buttons. And the “ok” button will grow as much as it needs in order to keep a right margin of 10 with the right border. 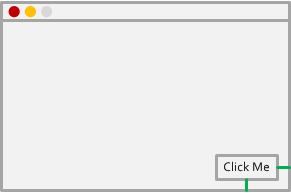 We specify 2 different rules where we set the vertical margin between the buttons and the bottom border of the window, and also the button height (or vertical size). Now that the constraint language is crystal clear ;-): how is this set on a MonoMac application? // nothing works if you do not specify this!! Specify horizontal and vertical constraints. Set the “TranslatesAutoresizingMaskIntoConstraints” to false! We’ve discussed about whether going native or use multi-platform UI toolkits, then we went through the ‘imperative vs designer based’ UI implementation alternatives and later we introduced some very common Cocoa controls. Finally we dissected the “launcher dialog” in SemanticMerge to explain how constraints work. Hope you find this post useful and happy Mac C# hacking.